The Animal League Defense Fund’s rankings of the top-five and bottom-five ranked states for the 2013 report (click on image for larger size). Note: The annual ALDF report is based on each state’s existing laws and does not take into account the conduct of its animal rescue groups and organizations or the conditions of its shelters. For a little humor, take a look at “11 strange animal protection laws” in the sidebar to the right. 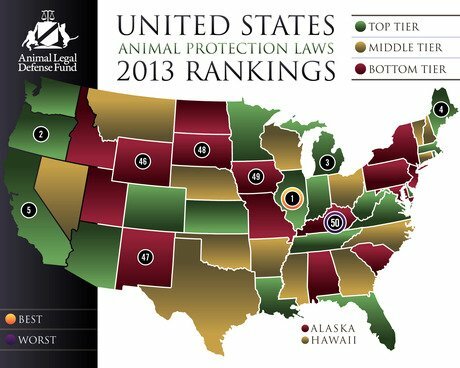 For the fourth year in a row, Kentucky ranked 50th (last), while Illinois ranked first for a fifth straight year in an annual study that evaluates the strength of animal protection laws in each American territory. The Animal Legal Defense Fund (ALDF) featured the 2013 findings in its 8th annual report, which was posted in December. Top and bottom-five rankings are limited to U.S. states. States featured in the top five for 2012 remained so for 2013, albeit in a different order: Oregon moved from 5th to 2nd, Michigan rose from 4th to 3rd, California dropped from 3rd to 5th, and Maine fell two slots from 2nd to 4th. These same states have been ranked in the top five for the past six years. Arizona was the most improved jurisdiction overall for 2013, moving up 12 places from its 2012 22nd rank to 10th last year. One of the main reasons for the jump for the Grand Canyon State is its adoption of cost of care statutes, which allow a judge to require that an offender pay for the care of a victimized animal. California, Hawaii, New Jersey, North Dakota, and Pennsylvania also adopted such statues last year. Speaking of North Dakota, on the reverse end of the scale, the Peace Garden State moved out of the bottom five from 2012, making room for Wyoming at 46. With Kentucky retaining the worst position, Iowa fell to 49, New Mexico went down a notch to 47, and South Dakota dropped one slot to 48 for 2013. According to the report, South Dakota is now the only jurisdiction without an animal cruelty felony penalty. Three states — North Carolina, Oklahoma, and South Carolina — took the biggest rankings plunge, as each fell eight slots from their respective 2012 positions. “Each state and territory has plenty of room for improvement,” ALDF Executive Director Stephen Wells says. “We hope lawmakers recognize the need for serious progress in animal protection laws across the nation. The full report is on the Animal Legal Defense Fund’s official website, where you can also find out how Canada’s animal protection laws fared in 2013.